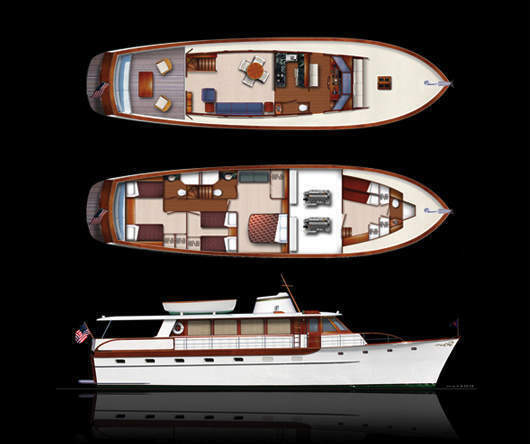 PALM BEACH, FL –For classic yachting enthusiasts, the Trumpy line of yachts is synonymous with yaching elegance. The 2009 Palm Beach International Boat Show along the Intracoastal Waterway and Flagler Dirve, will welcome hundreds of vessels March 26-29, and among them is the extraordinarily restored and refitted 1969 classic, the 63-foot Trumpy Showtime. What makes Showtime exceptional is that while retaining her classic lines and beauty she has been refitted with state-of-the-art appointments and high-tech products for today’s yachting lifestyle. With the glorious Palm Beach setting, Showtime is the perfect yacht at the perfect show. Inspired by the 1969 Showtime, the iconic Trumpy name will soon grace the hull of an elegant new motor yacht. The company will be introducing the Trumpy 63 Flush Deck Motor Yacht built to the highest standards by Vicem Yachtswhich has built a strong reputation and following as an elite builder of exquisitely handcrafted, mahogany composite classic-style luxury yachts. The base price is just under $3 million. IYC (International Yacht Collection, LLC. ), is pleased to announce that they have added two yachts to their charter fleet.